Disney Gift Guide for Adults! Affiliate links are included in this post; I get a small percent of sales at no extra cost to you. Thanks for supporting the blog, and please share the image below! Disney Gift Guide – For Adults! I’m a huge fan of all things Disney, so I’m always really excited when I see Disney related products or learn about new collaborations that Disney has going on. 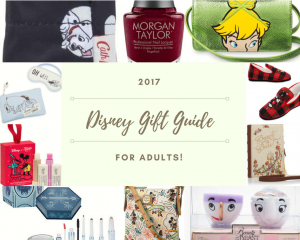 Therefore, I thought I’d create a fun gift guide of Disney items that would make the perfect gift for adults. Why should kids get all the Disney fun? You can see most of my picks in the image above, but check out the widget to a full idea of what’s included (as well as the price – and if any sales are going on). For the friend or family member always on the go, might I suggest this Eeyore Sleep Mask? It’s important to keep up with your sleep, especially this time of the year when everyone seems to be busier than usual! Another practical, but oh so cute, idea would be this adorable Disney umbrella! Now if you’re looking for something for a night on the town, or have a bag-aficionado to shop for, there are plenty of Disney themed bags and clutches to grab. A couple in my guide include the Beauty and the Beast book clutch, which I find absolutely adorable and I think any bookish girl would love to have, as well as the Tinker Bell cross body bag – a cute, fun bag for a girl’s night out! Plus, I love cross body bags! What do you think? Anything catch your eye, or do you have your own Disney related product to share? Let me know in the comments! Also, I’d be happy to do more of these gift guides so feel free to leave themes/categories you’d like me to focus on! You know who did an awesome Disney collaboration, that I loved, Le Sport Sac. I think I bought three of the Small World totes for her, because she loved them so much. I seem to always love the bags (as I do the ones pictured above). That’s why I have waaaay too many. Oh my goodness! That lip gloss duo is adorable! I also really love Disney coffee mugs for gifts! These are so cute! Great ideas! I will never grow out the Disney in me. It will forever stay. My favorites are Disney Sketch Crossbody Bag by Dooney & Bourke, Eeyore Sleep Mask for Adults, and Danielle Nicole Disney’s Beauty and the Beast Book Ivory-Color Clutch. Gotto go. I’m gonna buy it NOW. Hi Elizabeth! I really love those items too. Aren’t they just adorable? I’m glad I could help you find some new, fun things! Years ago Disney used to have a collectible Ebay store and I got SO many cool things and really cheap but I haven’t bought much from them since then. These are all so fun! I love Disney. I think any of that Disney themed makeup would probably be on my list! So fun! I love this roundup! I’m about to go to Disneyworld so this is perfect timing! Oh, very good timing! And I’m so jealous you’re going to Disney World. Have fun! How sweet! My teenage nieces love this stuff. This post makes me want to buy all the disney for ME and blow off buying gifts xD jkjk My cousins are super obsessed with Disney and would love some of these disney themed gifts. Omg that tink purse is too cute! I love, love, love Disney! We go every other year. Those plaid slippers are my fave! I have so many friends who LOVE disney so this is perfec! These are all so cute! I have a friend who loves Disney things so I will make sure to pass this on to her! So many cute items. My co-worker loves all things Disney and would love anything from this guide. We took our littles to Disneyland for the first time last Spring, now I am all things Disney! Oh, you totally need a mini Ursula in your life!! I haven’t bought anything Disney for a while, but I do love PJs, socks and t-shirts with Disney characters. My Disney wish list this year includes anything Moana themed! I LOVE that Dooney & Bourke purse! I haven’t seen a D&B in years and for some reason, had completely forgotten about them. These would make great gifts! A little Disney will always make me smile! Great guide! That TinkerBell bag is adorable! I may need to try and snag it for myself! I would love just about everything on this list! I’m a Disney freak! Oh I love Disney!! These things are great. Thanks for sharing! I love the Beast makeup bag! I am a sucker for anything Beauty and the Beast! So many awesome ideas! I’m going to be clicking links and drooling for the next hour. 🙂 Thanks for sharing these, Lauren! Yay for functional and cute presents! I love the tote bag! Cute! I know a few who would love those. I love all things Disney so this post is right up my alley. My favorite Disney related gifts are PJs and coffee mugs. I can’t get enough of them. I love those Disney purses. So cute!! !